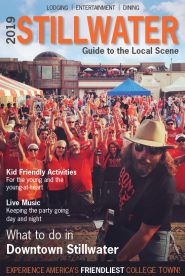 (STILLWATER, Oklahoma / April 15, 2019) —Now in its eighth year, Bob Childers’ Gypsy Café has grown beyond 60 of Oklahoma’s best songwriters swapping songs across three venues to include a lifetime achievement award, a songwriting contest and a free campus preview at nearby Oklahoma State University. For fans of intimate live music highlighting Oklahoma’s storied songwriting tradition and future, this festival on May 1, 2019 is a must. 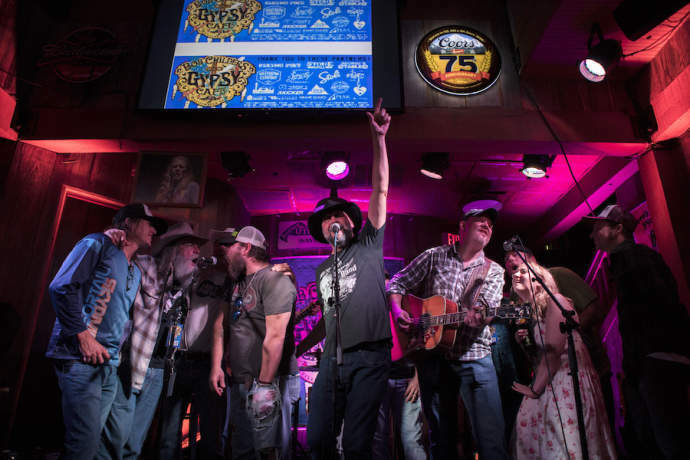 This night of musical surprises showcases Oklahoma’s best songwriting talent, culminating with a Family Jam finale on the Grand Casino Main Stage at Eskimo Joe’s. The fest will also include a silent auction and merchant area on Elm St. where the street will be closed between Eskimo Joe’s and George’s Stables. All proceeds from the festival benefit musicians through the Red Dirt Relief Fund, a non-profit organization that provides a safety net of critical assistance to Oklahoma music people across all genres, not just Red Dirt. Operated by an all-volunteer Board, RDRF has granted over $110,00 to musicians in the state since 2012. Bob Childers’ Gypsy Café raised $30,764 for the cause in 2018, funding the full grant load for last year. TICKETS: Festival passes are $20 in advance at http://www.reddirtrelieffund.org/gypsycafe or in person at Eskimo Joe’s Clothes in Stillwater. Day-of tickets are $25 or $20 for students with ID. A limited number of reserved seating VIP tickets for Eskimo Joe’s Main Stage are $50. Fans interested in making a Red Dirt run in Stillwater can also purchase a “4-Day GA” Calf Fry ticket that includes a Gypsy Café festival pass at https://amplitix.com/tumbleweed/20901. RESTLESS SPIRIT AWARD: Just before the Family Jam Finale begins on the Main Stage, the 2019 Restless Spirit Award will be presented to beloved Oklahoma fiddler, Randy Crouch. Crouch, who lives in a self-constructed geodesic dome near the Illinois River and refers to his songs as “Oklahoma protest music,” learned to play piano, guitar and ukulele at a young age, and was influenced to learn and play the fiddle by his grandfather, Daddy Mack, an accomplished fiddler himself. He was a regular at The Farm in Stillwater where the red dirt music movement was born. He’s written songs and played with bands including Jason Boland & the Stragglers, Red Dirt Rangers, South 40, Vince Herman Trio and his own Flying Horse Opera which has been an Oklahoma staple for more than 30 years. Crouch will also perform as part of the Bob Childers’ Gypsy Café Festival. Prior to the award presentation, filmmakers working on the documentary “Randy Crouch: Survival of the Fiddlist” will share a video created to highlight how his songwriting and character impact the Red Dirt scene. Learn more about the full documentary at RandyCrouchMovie.com @RandyCrouchMovie #RandyCrouchMovie. The Restless Spirit Award is given by the Red Dirt Relief Fund in recognition of a musician who has impacted the Oklahoma music community in a spirit akin to Bob Childers, a prolific songwriter and the so-called godfather of red dirt music. Previous honorees include Jimmy LaFave (2017) and Brandon Jenkins (2018). OSU CAMPUS SHOWCASE: From 2:00-4:00pm on May 1, songwriters including Kaitlin Butts, Jake Flint, Thomas Trapp, Mallory Eagle and Ben McKenzie, will perform two acoustic sets in a free show for students at the Oklahoma State University Union Amphitheater. Presented by the Student Union Activities Board, the Campus Showcase is meant to engage students with live, local music in conjunction with the festival. Students can purchase half price Gypsy Café festival passes and T-shirts at the Showcase. FOR MORE INFORMATION: Visit www.reddirtrelieffund.org/gypsycafe. For media inquiries or credentials, please contact Katie Dale at reddirtrelieffund@gmail.com or 918-407-4599.